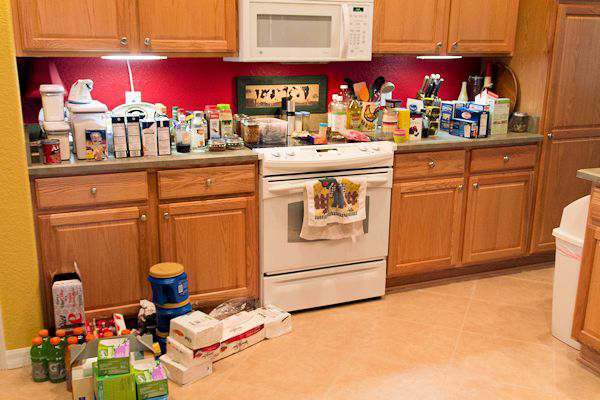 Does everything fall out of your pantry when you open it up? Mine use to until I organized it and now I can actually find what I need. Oh my, I have been putting off this job for so long. Months. Maybe years. 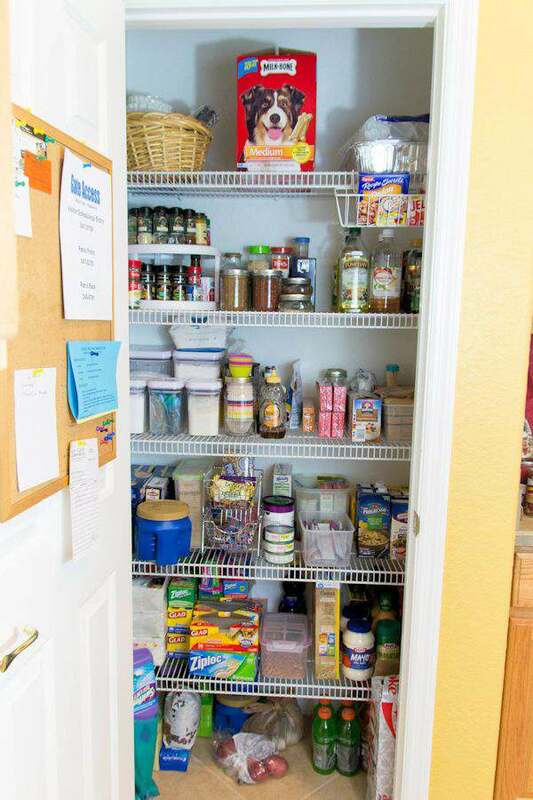 I would just shut the door on the pantry and not look at it. Hoping nothing was growing in there or fall off the shelves. Then the day came when I couldn’t find what I was looking for, went to the store and bought more of that item I found later in the pantry mess. It was time to organize the pantry. Last year I organized my office closet and still love how easy things can be found. 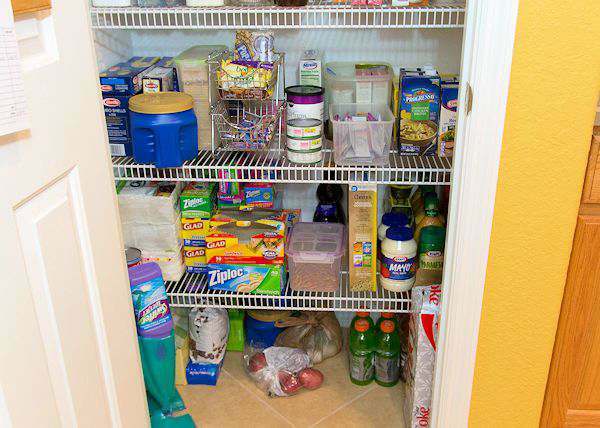 My pantry is a smaller closet with deep shelves, which I am not a fan of. For 2 people, it’s great and holds more than what we need. But when it starts looking like the picture above. It’s time to take action. Let’s say that is a form of dysfunctional organization. First I took everything out of the pantry. I found this to be the best way and then you can really see what you have. What you need to keep or discard. I started separating most of the items as I pulled them from the shelves. 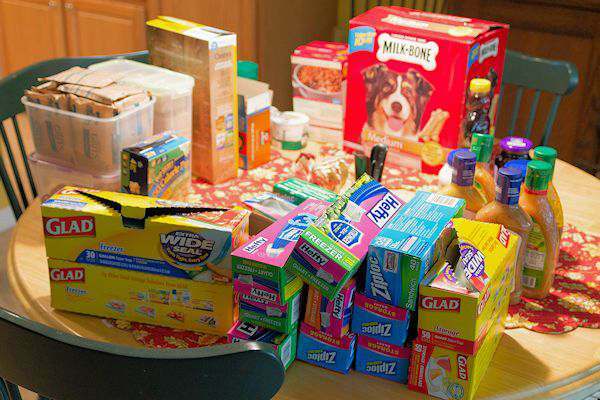 I love to coupon and when I can get a really good deal on an item for the pantry, I grab it. Do I honestly need 15 boxes of plastic storage bags? Absolutely. Now when I buy items I have a stockpile of, I just buy 2 of them when they go on sale again. Most of them are freezer bags and we do buy bulk amounts of meat to store in the freezer. After discarding items out of the boxes they came in, getting rid of really old spices and other items, I started arranging them on the shelves. Ernest T. Bass, the rescued boxer, must have the giant box version of his treats. It must be there at all times he says. If you have a dog, you know what I mean. Especially a large dog. I love the little hang on basket for small items to go. I found those items underneath other stuff. 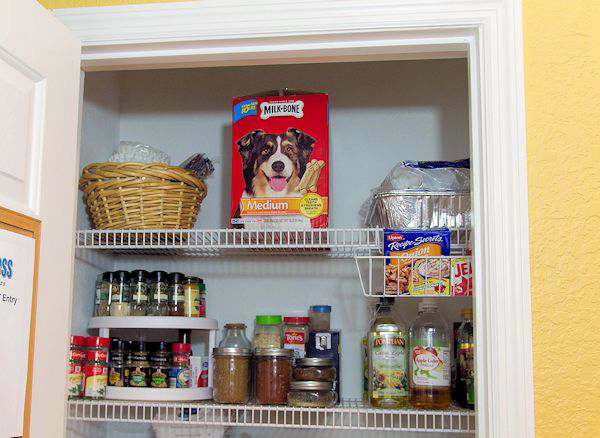 A pantry must have a Lazy Susan. Its perfect for all the spices I have. I did have very large containers of other spices that I just transferred them to mason jars to save space. I actually could use another Lazy Susan for those spice jars. All the vinegar and oils I use sit nicely on the second shelf now. I needed storage bins for all my baking supplies. Flour, sugars, cornmeal, etc. So I did invest in a few of the OXO Good Grips. The 4 qt size holds a 5lb bag of sugar or flour perfectly. The smaller ones are for brown sugar, confectioners sugar and cornmeal. I had been hoarding a few gift cards and figured it was the perfect time to buy the storage containers. I love them. I do need to put some nice labels on them now so hubby can tell what is in them. Need storage for your paper cupcake liners? Just grab a large mason jar and they will fit nicely in there. I have a few silicon cupcake liners which sit on top. I love the silicone liners. You can use them over and over. I keep the paper liners if I am making muffins to take somewhere. I put all our oatmeal and grits in plastic containers I already had. The 3rd shelf is done. On the 4th shelf, I put all the boxed pasta and broth in a nice order so I can tell what I have. The granola bars in a stackable bin which I actually used for k-cups when I use to drink coffee, dried beans and hubby’s favorite drink powder mix in plastic containers I already had. A few other odd items are also there. See that blue coffee container just sitting out of place? More about that in the next section. 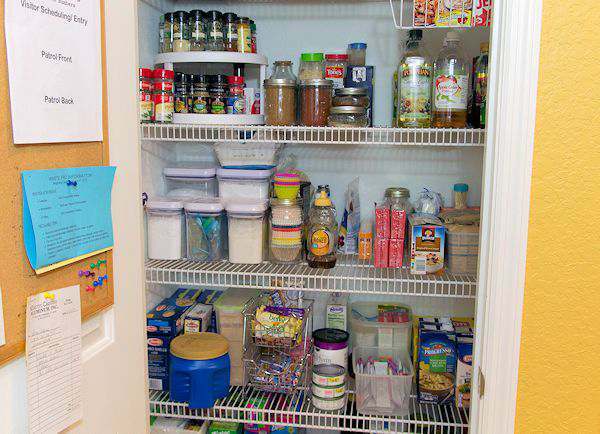 The next to the last shelf has all the paper items, napkins, plastic storage bags, cereal, and condiments. When the plastic bin is empty, I will use it somewhere else. All the drinks and potatoes sit on the floor. The potatoes need a storage bin to keep them off of the floor. All the coffee hubby has is there too. Along with his sodas for his work lunch. I love the extra space and items gone that shouldn’t have been in there. And actually, I really didn’t spend a really long time doing this project. I’m so glad I took an afternoon to work on this because we both can now find things we weren’t able to before. The recycle bin was heaping when I took it out to the street for the trash guys to pick up. I’m still working on ideas for kitchen labels and would love to know what you think would be a good idea for my pantry. Be sure to check out WorldLabel and see all their examples for your kitchen too. I’m a little partial to these labels which would look great on the Mason Jars with the spices. Just download the file and print on a full-size label sheet and cut them out. You could use your cutting machine for this job too. 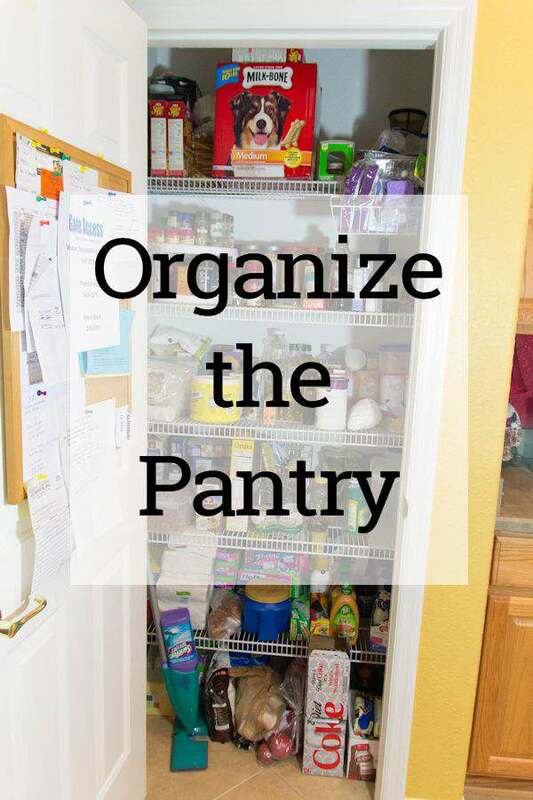 Do you have a pantry which needs to be organized? Wow! Great job, my friend. I love the idea of putting paper cupcake liners in a mason jar. Mine are just falling all over the place right now. 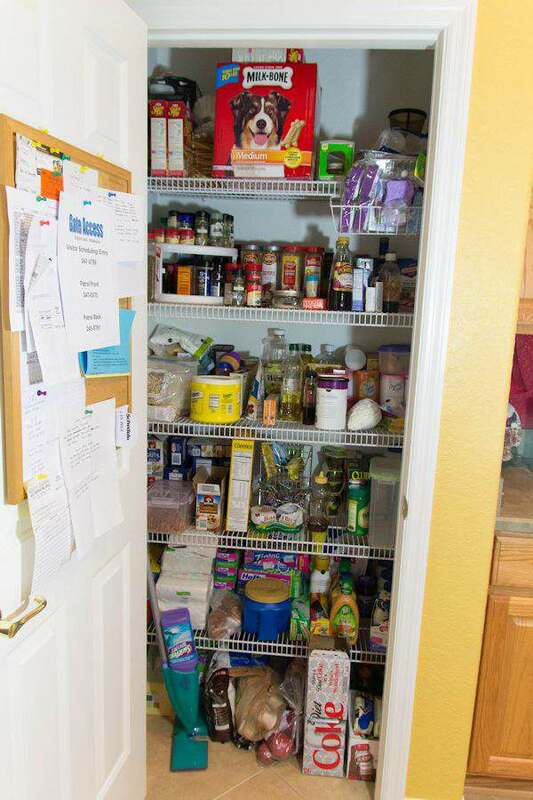 I just cleaned out my pantry too. I had to throw away 2 garbage bags of (very) expired food! I won’t even tell you the dates on some of my spices. It makes me smile to look at now though. My kitchen still has a long way to go, but it’s remains at the top of my to-do list.